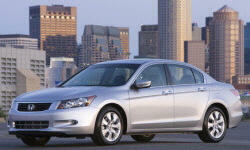 Honda Accord Reliability & Durability Pros and Cons | Page 1 of 6 | Why Not This Car? I have only had problems with the rear brake rotors over 3 years and 44000 miles. They were turned at around 20k miles due to pulsing, and I replaced them at 40000 miles due to pulsing. That is as good as it gets for any car I've ever owned. It's been fairly reliable. I have put nearly 80,000 miles and so far I have only had to deal with brakes. This "why to buy" is tentative. While the regular Accord's reliability has been excellent, Honda has produced some decidedly unreliable hybrids in the past. So I'd like to see more time and miles before declaring the new Accord Hybrid glitch-free. After 110 000 km, my Accord has been dead reliable, needing only rear brakes (under warranty) and the regular LOF maintenance. Now approaching 140,000 miles and other than 2 sets of tires, only cost has been maintenance as called for by Miantenance Minder. I drove an 2008 Accord to 150,000 and passed on to a family member with similar experience (although brakes had been replaced). Our past Hondas have been the most reliable cars we've owned. I would expect the Accord Coupe to be much more reliable long-term than the Volkswagen. Owned since new. Have only done normal maintenance. No repairs at all other than back brakes at 45K and new tires at 41K. Love it. You still see Accords that are 10-20 years old running perfectly. I expect that to still be true. Historical experience. The parts that matter most to drivability will last - in my experience an Accords drivetrain will remain functional while the body rusts away. I drove each of my Accords for more than 14 years with no major repairs.